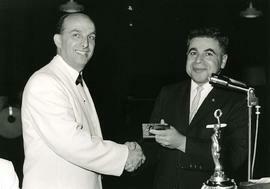 Photograph depicts Alec Jackson presenting an award to an unidentified man at a B'nai B'rith event. Photograph depicts Alec Jackson presenting a 50 year certificate to Max Poplack at the Diamond Jubilee celebration for B'nai B'rith Vancouver Lodge #668. 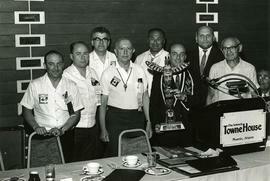 Photograph depicts Alec Jackson (left) presenting Maurice Lifchus (right) with a distinguished service award at a B'nai B'rith Lion's Gate Lodge #1716 installation banquet at the Georgia Hotel. Photograph depicts a table full of trophies with posters behind it.